CryptoMix Ransomware is one of the malicious applications that harm user’s data by encrypting it with a strong cryptosystem. It seems there are a few slightly different versions of this threat and if you read the rest of the article we will explain you their differences. Most of the malware’s variants mention particular email address in their ransom notes. No doubt, if you contact these hackers, they will most likely try to extort money from you. In exchange for paying the ransom, they could offer to send you decryption tools. At this point it is important to say, these people are not trustworthy, and if you deal with them you could end up losing not just the encrypted files, but also invested money. Therefore, we believe it would be best to pay no attention to the ransom note and eliminate CryptoMix Ransomware. Below the article, we will place removal instructions showing how to erase the threat manually, so if you need any help with this task, we encourage you to follow them. At the moment of writing there is still not much information about this malicious application, so we cannot be one hundred percent confident about its distribution channels. Since many similar ransomware programs are spread through infected email attachments or other malicious files downloaded from the Internet, for example, bundled setup files, fake updates, etc., we believe CryptoMix Ransomware’s creators might use these methods as well. In any case, if you want to be prepared to guard the system against threats alike the next time, you should take extra precautions. For instance, each file downloaded from an unreliable source including email attachments received from unidentified senders should be checked with a reliable antimalware tool to see if they are not dangerous. Users are also advised not to visit potentially harmful web pages or sites that could distribute malware. Plus, if you have irreplaceable files you do not want to lose it would be a good idea to make copies of them and keep them somewhere safe, e.g. cloud storage, external hard drive, and so on. 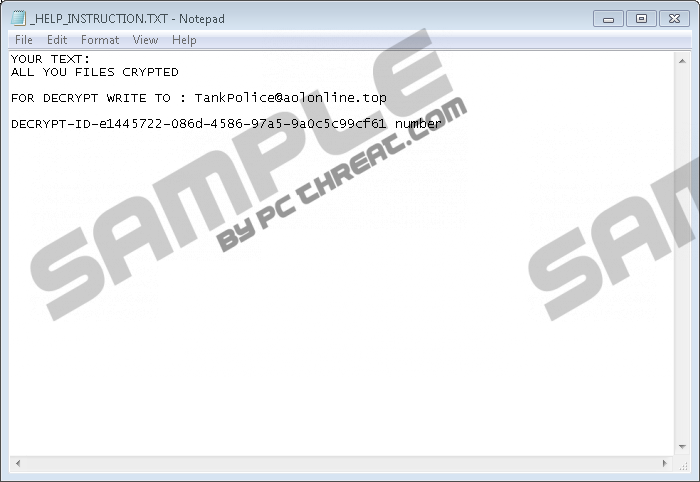 Once CryptoMix Ransomware settles in the malicious application may place a file responsible for data encryption in the %APPDATA% directory. As for the threat’s launcher, it should remain to be in the folder where the user downloaded it, for example, Downloads, Temporarily Files, etc. It does not look like any of the infection’s versions can change user’s background or lock the screen. Our researchers only noticed it placing the mentioned file in the %APPDATA% folder and a ransom note. Different CryptoMix Ransomware versions might have different additional extensions that they apply to each encrypted file, for example, one of the malware’s variant placed .ZERO extension and others marked files by appending .OGONIA, .lesli, and various other extensions. The infection’s ransom notes should differ too since they may mention different email addresses. However, the ransom note is only but a short message from the malicious application’s creators. It does not demand payment or state any other conditions. All the ransom note says is that decryption is available if you contact the infection’s developers through given email address. Our researchers do not advise paying the ransom since there is a chance the hackers could trick you and so it could be a complete waste of money. Consequently, we urge users to ignore the provided ransom note and get rid of the malicious application at once. There are two options to choose from. The first one is manual deletion while following the step by step instructions placed below the text. The other option might be easier for less experienced users as it only requires an installation of a reliable antimalware tool. If you employ such software, you can perform a system scan, and CryptoMix Ransomware would be detected automatically. Then to erase the malware and other possible threats the antimalware tool could have identified, you should click the removal button. Find a malicious process related to the malware. Click this process to mark it and press End Task. Exit Task Manager and tap Win+E. Locate the Desktop, Temporary Files, and Downloads folders. Look for a malicious file that infected the computer. Right-click the threat's launcher and press Delete. Navigate to %APPDATA% and find a suspicious executable file belonging to the threat. Locate the ransom note and get rid of it too. Go to your Startup directory and delete suspicious applications set to run on startup. Quick & tested solution for CryptoMix Ransomware removal.